Barred from seeking re-election to a second term in 1997, he worked in the private sector until 2000 when he ran for the United States Senate, defeating two-term Democratic incumbent Chuck Robb. Allen ran for re-election in the 2006 election, but after a close and controversial race, he was defeated by Democratic former Secretary of the Navy Jim Webb. When Webb had decided to retire, Allen ran for his old seat again in the 2012 election but was defeated again, this time by Democratic former Governor Tim Kaine. 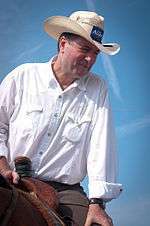 Allen now serves on the Reagan Ranch Board of Governors of Young America's Foundation, where he is a Reagan Ranch Presidential Scholar. In November 1993, Allen was elected the 67th Governor of Virginia, serving from 1994 to 1998. His opponent in the 1993 election, Attorney General Mary Sue Terry, had an early 29-point lead in public opinion polls and a million-dollar fundraising advantage; his other opponent was Independent Nancy B. Spannaus. However, Allen's campaign proposal to abolish parole may have resonated during a surge of crime in the state. More importantly, he was running during the 1994 Republican wave. Allen overcame the deficit and won with 58.3% of the vote, the largest margin (+17.4 points) since Albertis S. Harrison Jr. defeated H. Clyde Pearson with a margin of +27.7 points in 1961. Allen could not run for re-election because Virginia's constitution does not allow a governor to succeed himself; Virginia is the only state that has such a provision. Sidarth, who is of Indian ancestry, was born and raised in Fairfax County, Virginia. Allen's "Macaca moment" quickly went viral and, virtually overnight, it became the hot topic on all of the network and cable television news shows. Webb won by approximately a third of a percent – 8,805 votes – but it wasn't until November 9, 2006 that Allen held a press conference in Alexandria, Virginia, announcing that he had conceded the race to Webb and would not seek a recount. In February 2011, Webb announced he was not running for reelection. Allen faced former Virginia state governor Tim Kaine in the November 2012 general election for U.S. Senate, and was defeated by a 53–47 margin. ↑ Mulkern, Anne C. (June 2, 2009). "George Allen returns, tries to counter Democrats on climate". The New York Times. Retrieved 2012-09-30. ↑ "George Allen". Football Hall of Fame. 2006. ↑ "New 'N Word' Woe For George Allen". CBS News. September 26, 2006. Retrieved August 30, 2007. ↑ "George Allen: Pro Football Hall of Fame Head Coach". About.com. 2006. ↑ "George Allen: Principals". www.georgeallenstrategies.com. 2009. ↑ "Coach Allen would love this fight". The Washington Times. September 27, 1991. Retrieved 2012-09-30. 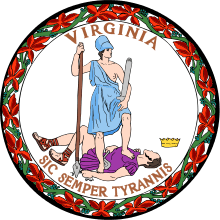 ↑ "Welcome to the Virginia House of Delegates". Dela.state.va.us. 1920-07-04. Retrieved 2012-08-15. ↑ "Governor George Allen". Young America’s Foundation. Retrieved May 22, 2011. ↑ "Delegate Renews Fight To Expand Death Penalty". Daily Press. 1989-01-16. Retrieved 2012-08-15. ↑ Gersh, R. D. (February 3, 1983). "Lottery bill heading for vote by delegates". The Free Lance-Star. ↑ "Editorial: Digging into dealers' pockets, not taxpayers'". The Free Lance-Star. November 1, 1990. ↑ "Welcome to the Virginia House of Delegates". Dela.state.va.us. Retrieved 2012-08-15. ↑ "VA District 7 Special Race – Nov 05, 1991". Our Campaigns. Retrieved 2012-08-15. ↑ Tapper, Jake (November 17, 1999). "Dead senator running?". Salon magazine. ↑ Hagens, Winnett W. (1998). "The Virginia Redistricting Experience, 1991–1997". In Grofman, Bernard. Race and Redistricting in the 1990s. Agathon series on representation (softcover ed.). New York: Algora Publishing. p. 315 & seq. ISBN 978-0-87586-262-0. Retrieved August 22, 2010. ↑ "The Virginian-Pilot Archives". Nl.newsbank.com. 1991-12-20. Retrieved 2012-08-15. 1 2 "Revolving Door: George Allen Employment Summary". OpenSecrets. Retrieved 30 September 2012. ↑ B. Drummond Ayres Jr (November 3, 1993). "The 1993 Elections: Virginia; Conservative Republican Wins Easily". New York Times. 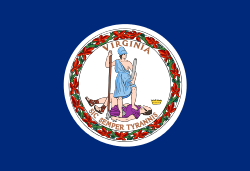 ↑ "The Virginia Elections and State Elected Officials Database Project, 1776–2005". University of Virginia Library. Retrieved November 9, 2006. ↑ "Governor of Virginia". Our Campaigns. Retrieved 2012-09-30. ↑ "One Price of a One-Term Governor High Turnover". The Virginian-Pilot. May 16, 1996. p. A14. Retrieved October 4, 2006. ↑ ""A Decade of Welfare Reform: Facts and Figures," The Urban Institute" (PDF). Retrieved 2012-09-30. ↑ Nixon, Ron (April 25, 1999). "Toxin Data Kept Secret; Few Had Access to DEQ Database". The Roanoke Times. ↑ "DEQ denied scientists access to data". Associated Press. April 25, 1999. ↑ Timberg, Craig (October 14, 2000). "An Environmental Question Mark; Allen, Opponents Dispute His Legacy in Va.". The Washington Post. ↑ "Stafford News Digest: Environment". The Free Lance-Star. July 21, 1999. ↑ "Legislative watchdog group to look into monitoring of waterways". Associated Press. May 11, 1999. ↑ Nixon, Ron (July 13, 1999). "DEQ Lost and Destroyed Water Data, Audit Finds; Allen Administration Budget Cuts Blamed". The Roanoke Times. ↑ Nixon, Ron (May 11, 1999). "JLARC to Investigate DEQ Toxic Monitoring: Database Withheld for 5 Years". The Roanoke Times. ↑ "Xybernaut SEC filing, Form 8-K, September 19, 1999". Secinfo.com. Retrieved 2012-09-30. ↑ Trandahl, John (June 21, 2001). "STATISTICS OF THE PRESIDENTIAL AND CONGRESSIONAL ELECTION OF NOVEMBER 7, 2000". Archived from the original on September 29, 2006. Retrieved October 4, 2006. ↑ Schapiro, Jeff E. (May 17, 2006). "Former Robb aides endorse Webb in primary". Richmond Times-Dispatch. Retrieved October 31, 2006. ↑ "George Allen on Budget & Economy". On the Issues. Retrieved October 4, 2006. ↑ "Allen, Talent Introduce Constitutional Amendment on Line Item Veto" (Press release). September 27, 2005. Archived from the original on November 16, 2005. ↑ "ALLEN CALLS FOR A "PAYCHECK PENALTY" ON CONGRESS". American Chronicle. February 10, 2006. Retrieved October 4, 2006. ↑ "National Innovation Act Introduced". UCLA Government & Community Relations. December 15, 2005. Retrieved October 4, 2006. 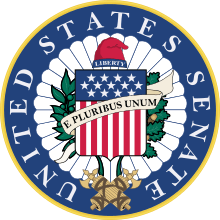 ↑ "S. 1706: Long-Term Care Act of 2005". GovTrack. Retrieved October 4, 2006. ↑ "S. 901: Flexibility for Champion Schools Act". GovTrack. Retrieved October 4, 2006. ↑ Heilemann, John (March 13, 2006). "George III". New York Magazine. Retrieved October 27, 2006. ↑ Glazer, Gwen (April 29, 2005). "Signed, Sealed... But Not So Fast. Insiders' Predictions For WH 2008 May Not Match Public's Vision". National Journal. ↑ "McCain Roars Past Allen In New NJ Insiders Poll". National Journal. May 11, 2006. 1 2 Anita Kumar (September 27, 2011). "George Allen's Energy-industry Interests". Washington Post. ↑ Trygstad, Kyle (February 9, 2011). "Webb Won't Seek Re-Election". Roll Call. Retrieved February 9, 2011. ↑ "Kaine cut into GOP strongholds en route to defeating Allen". Richmond Times-Dispatch. 7 November 2012. Retrieved 7 November 2012. ↑ "Republicans fight to reclaim the Senate majority: 2012 races to watch". ABC. 1 June 2012. Retrieved 8 June 2012. ↑ Anita Kumar and Laura Vozzella (December 7, 2011). "Obama looms large in first debate between Va. Senate candidates George Allen, Timothy Kaine". Washington Post. ↑ "A Tough Question for George Allen". The Decembrist. May 13, 2005. Retrieved August 15, 2006. ↑ Milbank, Dana (February 6, 2006). "Mixing Politics, Pigskins". The Washington Post. p. C01. Retrieved May 3, 2010.